During my time here in Sicily, I’ve had my fair share of time to explore the city and experience new things. In deciding to come here, I believed that Italy would have many similarities to my home in New York, but over the past two weeks, one thing I have noticed is that there are actually quite a few differences between my tiny suburban town of Rhinebeck, NY and this condensed city of Siracusa. I’m here to focus on these differences – good and bad. Some of the first things I noticed right away were the many minor differences in everyday living. You’d never know how many different ways there are to flush a toilet until you come to Europe. At home, the most common way to flush a toilet is by pushing down the handle, but here, there aren’t even handles. I’ve seen everything from buttons on the wall, to buttons on the toilet, to pull chains (similar to a lamp), and the oddest of all, a button on the floor that you compress with your foot. Then there are the keys; there are keys for almost everything. You can lock your bedroom doors, bathroom doors, and even closets with keys that generally never even leave the keyhole because they serve a double purpose as a handle. This whole key thing wasn’t even a big deal to me until I realized there were keys for the china cabinets and random trap doors built into the walls of the bathroom in my shared apartment. Don’t even get me started on the elevators in Italy. For the few buildings that actually do have one, which thankfully includes my apartment building, they are tiny. In order for me and my six other roommates to get to our fifth floor apartment, we would have to take two to three trips in the elevator and hope it doesn’t get stuck between floors due to carrying excess capacity. Then, the doors don’t slide from the center like the ones I’ve experienced in the U.S., but rather there are two tiny doors that open inward while there is one larger door that opens outward onto each floor. Also, if a passenger forgets to close any of these doors when exiting the elevator, somebody on another floor will not be able to call it to their floor, which is how you end up with cranky neighbors. One of the main differences that my roommates and I learned right away was the food here in Italy. 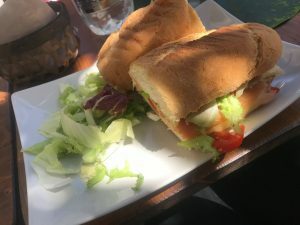 I’m pretty broad with the term food, because many aspects about it can be compared to the U.S. First of all, the food I’ve eaten in Sicily so far is definitely fresher than American food. Many food products in the U.S. are imported from other countries or between states. However, many of the foods in Italy are created using local ingredients, which is obvious when cooking and eating out. Speaking of which, when I eat out in the U.S. customers pay before they eat, unless they’re dining in at a restaurant. The difference with Italy is that even at small cafe’s, the servers don’t request payment until after you eat. 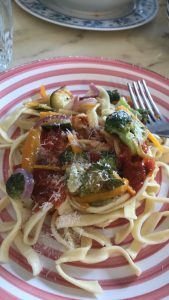 But the biggest food dilemma I have encountered is that Italy doesn’t have many of the foods I commonly eat at home. For instance, I can’t find just plain bagels, which I eat for breakfast everyday in New York, at a grocery store in Siracusa. Some other foods I’m reluctant to find are any cheese flavored chips, sunflowers seeds, peanut butter flavored chocolate, or peanut butter flavored anything for that matter. On the other hand, there are many foods I have encountered in Sicily that I have never tasted in New York. My biggest disappointment going home is that I won’t be able to have freshly-made arancini on every street. Rice balls for the win! 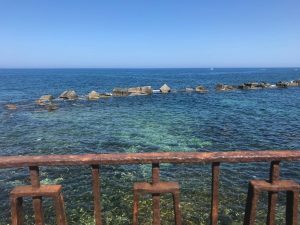 Lastly, I’m going to discuss how relaxed the laws are here in Sicily. I’ve seen and experienced many things that would not bode well in New York. When I first arrived at the airport in Catania, the drive to my apartment made me realize that the driving situation is pretty chaotic compared to New York. That may sound like an exaggeration, as New York is known for its crazy drivers, but drivers in Sicily often don’t use blinkers, they drive between lanes, and it seems as though motorcyclists and moped riders have all authority to pass on either side of traffic. There are very few lights at crosswalks, and drivers often don’t even stop for pedestrians. As for parking, that seems like a free-for-all. 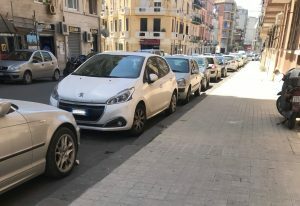 It almost seemed to me as if parallel parking didn’t exist in Italy, then I realized that many drivers park in either direction on either side of the street, and many of them just pull into the sidewalk, or onto the sidewalk, or along a corner of two streets. This haphazard traffic situation makes it seem impossible for a foreigner to drive, or even walk, in a busy city area such as Siracusa. Deztiny is a summer SAI Sicily student from Rochester Institute of Technology.